Romano Pieri – of Woburn, March 26th. Beloved husband of nearly 63 years to Doriana (Santi) Pieri. Loving father of Paul Pieri, his wife Karen of Wilmington, Mario Pieri of Chelmsford, and Robert Pieri of Woburn, and his companion Marie Griffin of Wakefield. Cherished grandfather of Sheila Patterson, her husband Jason Boothby and Michael Pieri. Adored great-grandfather of Jackson. Dear brother of John Pieri, his wife Kathy of Wilmington, Anna Perin, Sylvana Leone, and Romana Pieri, all of Woburn and the late Lydia DelBuono. Also survived by many loving nieces and nephews. Relatives and friends are kindly invited to attend his Funeral Service in the Lynch-Cantillon Funeral Home, 263 Main Street, Woburn on Friday, March 29th at 11 a.m. Calling Hours will be held from 9:00 to 11 prior to the Service. Interment in Woodbrook Cemetery, Woburn. For directions or to leave an online condolence, story or message, please visit www.lynch-cantillon.com or find us on Facebook. 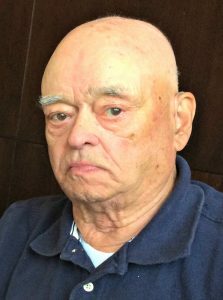 Romano Pieri, 91, a longtime resident of Woburn, died peacefully, Tuesday, March 26th, at his home with his family by his side. He was the beloved husband of nearly 63 years to Doriana (Santi) Pieri. Romano was born and raised in Barga, Italy, son of the late Ranieri and Letizia (Pieri) Pieri. After immigrating to the United States in 1948, Romano enlisted in the US Army where he served as a Private First Class in the Korean War, stationed in Germany. Upon his return, Romano married the love of his life Doriana, and together they built their home and family in Woburn. For many years, Romano worked as a Welder for Nevlin in Wakefield. Romano was man who enjoyed tinkering and building things with hands. He was a very good cook and his vegetable garden was his pride and joy. He loved sharing his fresh produce with friends and family. Spending time with his family and taking long drives anywhere, especially with his grandson Mike, were his greatest joy. Along with his wife Doriana, Romano is survived and will be deeply missed by his sons, Paul Pieri, his wife Karen of Wilmington, Mario Pieri of Chelmsford, and Robert Pieri of Woburn, and his companion Marie Griffin of Wakefield. Cherished grandfather of Sheila Patterson, her husband Jason Boothby and Michael Pieri. Adored great-grandfather of Jackson. Dear brother of John Pieri, his wife Kathy of Wilmington, Anna Perin, Sylvana Leone, and Romana Pieri, all of Woburn and the late Lydia DelBuono. Also survived by many loving nieces and nephews. Relatives and friends are kindly invited to attend his Funeral Service in the Lynch-Cantillon Funeral Home, 263 Main Street, Woburn on Friday, March 29th at 11 a.m. Calling Hours will be held from 9:00 to 11, prior to the Service. Interment in Woodbrook Cemetery, Woburn. For directions or to leave an online condolence, story or message, please visit www.lynch-cantillon.com or find us on Facebook. Relatives and friends are kindly invited to attend his Funeral Service in the Lynch-Cantillon Funeral Home, 263 Main Street, Woburn on Friday, March 29th at 11 a.m. Calling Hours will be held from 9:00 to 11 prior to the Service. Interment in Woodbrook Cemetery, Woburn. For directions or to leave an online condolence, story or message, please visit www.lynch-cantillon.com or find us on Facebook. Paul , Karen and family So sorry for your loss. My deepest thoughts and prayer go out to you and your family at this time.